Wagons and Tricycles, Oh My! At PNC Bank’s 2017 Circle of Excellence conference held in Chicago, hundreds of outstanding PNC employees from across the country took a break to help benefit El Valor’s youngest learners. PNC believes that each child should have the opportunity to reach his and her fullest potential. Play is instrumental in developing a young child’s mind. It is closely tied to the development of cognitive, socio-emotional, and physical behaviors. 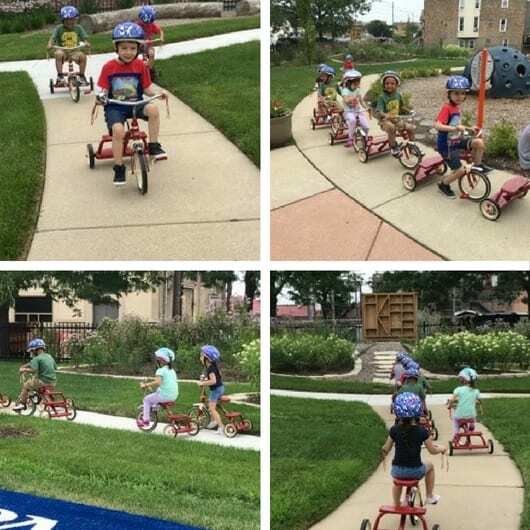 What better way to play outside during the beautiful Chicago summer, than riding a new tricycle? During Circle of Excellence, PNC’s employees rolled up their sleeves and helped assemble over 50 tricycles and wagons that were then delivered to El Valor’s Early Childhood Centers in South Chicago, Pilsen, and Little Village. Recognizing that safety is key, PNC also donated helmets for the children to enjoy with their new wheels. A tremendous thank to all the PNC employees who graciously donated their time to build the tricycles and wagons. El Valor is immensely grateful for PNC’s boundless generosity, and its dedication to championing the potential of all children.